The Coleman Heritage Centre has produced a number of vital recordings of music from South Sligo and here’s one more to add to your collection (albeit with a certain caveat). While Harry Bradshaw’s double-cassette compilation of James Morrison’s 78 recordings has been available for some time, this is the first occasion on which both he and Paddy Killoran’s music have appeared on compact disc in extended form. Shanachie transferred the fiddlers’ 78s to vinyl in the 1970s, releasing Paddy Killoran Goes to Town and The Pure Genius of James Morrison. Now Gregory Daly and P.J. Hernon have remastered tracks which appeared on those two LPs, cleaning them up even further in the process to produce From Ballymote to Brooklyn. The effect is stunning, almost as if the listener is hearing those 78s in pristine form with a seemingly total absence of background hiss or crackle, apart from a few of the Morrison recordings. They have, however, not followed the original track listings of the LPs, but then this in Killoran’s case at least (see below) can be recreated by judicious programming, if so wished. Despite receiving second billing in the album’s title, Paddy Killoran’s fourteen tracks form the first part of the CD. 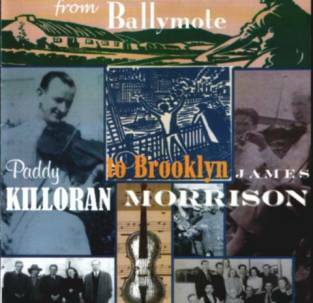 This is in itself a slightly eccentric decision since Morrison first recorded a decade earlier than the ten years’ younger Killoran and, more significantly, though influenced by the fiddler Philip O’Beirne (father of “Lad”) Paddy actually took lessons in New York from James Morrison. The effect, perhaps intentional, is to draw Killoran out from Morrison’s shadow. Even more oddly, however, while all 14 tracks from Paddy Killoran Goes to Town have been included on this CD, only 10 of the 14 tracks from The Pure Genius of James Morrison are present. Those absent are The Happy Birdie/The Blue Bell (polkas), The Provincial (hornpipes), Bonnie Kate/Miss Lyon’s Fancy/The Haymaker (reels) and Old Man Dillon/The Rose in the Heather. No explanation has been provided for these omissions and, surely, the producers must have realized at an early stage that the both LPs in their entirety would not have fitted on a single CD? Obviously, almost 74 minutes of music of this quality represents good value for money, but there’s a sense in which purchasers have been short-changed by the lack of those four Morrison tracks. Ultimately, it might have made better sense to have issued a double-CD or even two separate recordings. Furthermore, it is disappointing that the liner notes to From Ballymote to Brooklyn provide details of neither the dates of the various recordings nor information on the accompanists present. While noting that certain recordings involve duets between Killoran and Paddy Sweeney and Morrison with both John McKenna and P.J. Conlon, there is no mention of Killoran’s accompanists, the guitarist Whitey Andrews and pianists Jim McGinn and Edmund Tucker, nor is any reference given to Morrison’s various accompanists. Indeed, the liner notes also provide only brief summaries of both musicians’ careers. However, despite these misgivings, and a difficult to swallow the feeling that Morrison has been hard done by, anyone who possesses the original LPs (or even those exceedingly rare 78s) will want to invest in a copy of this album. For those bereft of such recordings, this CD represents a tremendous introduction to two of the most influential fiddlers in the history of Ireland’s traditional music. Moreover, it offers the chance to reassess the strengths of Paddy Killoran (whose lack of an individual entry in The Companion to Irish Traditional Music is one of that excellent book’s stranger omissions) who, if not quite matching the genius of Morrison’s playing of The Hollybush, is still worthy of hearing in his own right. One last peculiarity which ought to be mentioned is the album’s title. The reference to Brooklyn is perplexing, since, as far as I can ascertain, neither fiddler had any connection with that area of Greater New York. If anything, for alliteration’s sake at least, “From Ballymote to the Bronx” might have been preferable, since it was the Bronx in which Killoran ran a bar and Morrison is buried, but “Brooklyn” has a pleasanter ring, I suppose! The album is available directly from The Coleman Heritage Centre – www.colemanirishmusic.com.